While the list is by no means comprehensive (and some people may even disagree), these businesses were chosen based on our own research, readings from various business ideas books, and interviews with entrepreneurs. Some of the businesses that we have featured before — e.g. computer consulting, web design, catering, etc. — were excluded from the list even though these ventures perfectly exhibit the characteristic. Of course, how short the period your business can break-even will depend on various factors present in your venture, including demand for the business in your area, ability to market the business effectively, capital to start-up, and your management know-how. The business plan writing service is an exciting business that demands a combination of writing skill, business expertise, and creativity. Your task is to help new or existing businesses develop an overall blueprint that includes medium-term and long-term strategies, market positioning, financial requirements and start-up costs. This business is ideal for areas where many new businesses are starting and existing businesses are expanding. However, not all new entrepreneurs prepare a business plan: many find the process too tedious or they lack the knowledge to make one. Your most probable clients will be those entrepreneurs who are seeking loans, attracting investors, looking for franchises, or businesses at the point of being acquired. To start in this business, you need a strong business background, good knowledge of financial statements, good business writing style and the ability to see a business both from the perspective of the owner and the financial source. It would help if you have already put together business plans before so you know what questions to ask and what information to find. Study the various business plan software available in the market, but learn to adopt it to your client’s particular situation. Start-up costs for this business can be low particularly if you already have equipment like computer, fax, and Internet access. Your biggest cost may be professional liability insurance to help protect you when your recommendations for the future direction of the business turn south. Earnings, on the other hand, can range from $2,500 to $5,000 per project depending on the time it takes to write the plan (usually three to four weeks) and the amount of research you need to do. Your price can increase to as much as $25,000 per project, particularly for big corporations seeking new funding. You can also supplement your income through business editing and revising existing plans because of the change in your client’s circumstance. Like any new business, finding the first client is the hardest. Networking and referrals are the most effective ways of finding clients. Join chambers of commerce and economic development groups. Make contacts with bankers, venture capitalists, angel investors and organizations that offer business mentor programs or entrepreneurship centers. Hone your skills by preparing business plans free of charge at the beginning, in order to have a portfolio of plans you can show to prospective clients. If you have excellent organizational skills and enjoy arranging and organizing formal events and happenings, this business could be for you. An event or meeting planner arranges and coordinates meetings and other events for companies, professionals, non-governmental organizations, associations and large international organizations handling everything from room reservations, airport pick-ups, dinner menus to entertainment. Meeting planners usually organize conferences, sales meetings, conventions, trade shows, fund-raising events, special banquets, hospitality events, shareholder meetings, international symposia, and other professionally oriented events. The tasks of an event planner normally depend on the needs and requirement of the clients as well as on the planner’s specialization. Your main tasks are to establish meeting design and objectives, select and negotiate with site and facilities, create the budget, handle housing and transportation, plan the program, establish registration procedures, prepare back-up contingency plans, manage food and drinks, produce and print meeting materials, schedule promotion and publicity, manage exhibits, among others. To start in this business, you need to have a perfectionist’s attention to detail and a wide array of contacts in the travel, presentation, transportation and hotel industries. In addition to handling a wide array of elements needed for a successful event, you should be adept at negotiations and troubleshoot crisis situations. This business is ideally suited for those with background in public relations, communications or travel. You can start by volunteering to coordinate an event for an employer, a friend’s company, church or other groups. You can also start by working with a meeting planner in your area and taking on a portion of the tasks. This will allow you to gain skills in organizing events, and a first-hand look at what it takes to succeed in the business. The best ways to get ahead in this business is through networking in business groups and associations, contacting visitor’s bureau and city’s convention to learn of forthcoming events. Typical annual revenues for this business ranges from $45,000 to $60,000. You can charge either by the hour, by the day, by the number of attendees, or by the project. The average hourly fee is $40 to $60 per hour, while daily fees can run from $400 to $500 per day. Or if you are expecting 50 attendees, you can price the event at $40 per attendee. Others may charge 15 to 20 percent of the projected total budget for the event. A typical public relations specialist promotes people, products and events to the media or other resources in a variety of ways including press releases, special events and press conferences. However, according to the Public Relations Society of America (PRSA), there are fifteen elements of public relations: community relations, counseling, employee/member relations, fund raising or development, government affairs including lobbying, industry relations, investor or financial relations, issues management, marketing communications, media relations, minority or multicultural relations, public affairs, publicity, research, special events and public participation. As a public relations specialist, you can specialize in a variety of ways. Some specialize in crisis communications, Web publicity, copy writing, annual reports, non-profit sector, or authors and writers. To start in this business, you need to gain training and experience. You may want to get professional accreditation as an APR or Accredited in Public Relations (in the U.S., check with the PRSA). You may start with your own business by developing a plan publicizing your new venture and credentials to the right market. You can also offer volunteer to do publicity for your favorite charity, your friend’s business, or even a local candidate. Earnings from a home-based public relations business can range from $65,000 to even as high as $175,000. Overhead expenses are low to moderate at 20 to 40 percent of income. As more and more households and businesses embrace computer technology, the demand for repairing broken computer hardware will continue to increase. As a computer repair technician, your job is to maintain and fix computers at a customer’s business site or at home. Your service could include swapping motherboards, data recovery, disaster recovery, repairing network problems, removing viruses, installing software, troubleshooting modem and communication problems, repairing notebooks, and others. To maintain and repair computers, you need first to know how they work and what to do when they don’t. You need to know the mechanical workings of a computer, their interfaces and connections. If there are parts that need replacement, you must know where to get the components. You can develop your technical knowledge through reading books, taking courses on computer repair, videos and hands-on experience. Succeeding in this business, however, entails more than technical know-how. You need to have the personality and ability to provide a high level of service, as this is a customer-service oriented business. Computer repair is one of the most lucrative home businesses available. You can potentially earn $48,000 to $60,000 a year, assuming your billable hours are about 1,200 to 1,500 a year at $40 an hour. Some computer technicians charge as high as $85 an hour. You can also charge for either travel time or a flat fee for a service call. Overhead costs for this business is moderate at about 25 percent or less. If you love typing and the medical lingo, the medical transcription business is for you. A medical transcriptionist transcribes the medical records dictated by a healthcare professional, including letters, histories, physicals, progress reports, and chart notes. With the growing complexity of medicine, mounting threat of litigation and increasing demand on their time, the healthcare industry has relied on keeping dictated notes to document all aspects of their patient’s history and pushed the medical transcription business into a $50 billion industry. Superior listening skills, fast typing speed, and aptitude for science and language are required to succeed in this business. You need to have an understanding of medical diagnostic procedures and the medical specialties you work with, enough to know the medical terms and spell them correctly. This business is a good fit for those with medical background. If you have not studied or worked in the medical field before, you can take home-study course, correspondence course or classroom training in a vocational or technical school. To get clients, check with your existing contacts, other transcription services or solicit clients directly. You can also check out Internet sites that contract medical transcriptionists and use the Internet to send out documents. You can charge for your transcription services in a variety of ways: number of lines (10-20 cents per line), number of characters, per page (typically around $5-$6 per page), minute of dictation (from $15 to $50 per hour depending on the level of difficulty to understand), or the number of kilobytes in a text file. While actual earnings depend on the type of work done and the equipment used, average earnings of a medical transcriptionist ranges from $30,000 to $90,000). One downside, though: the emergence of voice-recognition technology where doctors could sit down on their computers and dictate their notes while the computer “types” may reduce demand for the medical transcriptionists. Nonetheless, even with the presence of this technology, medical transcriptionists will still be needed as it allows medical professionals to dictate notes on the tape recorder or over the phone while driving, walking or in the elevator. In addition, such technology can even be a boon for transcribers as it allows them to focus on their editing skills instead of typing speed. Businesses are not created equal. Some businesses are easy to start while others are more complicated. Some businesses can make money fast, while others take a longer time to recoup investments. 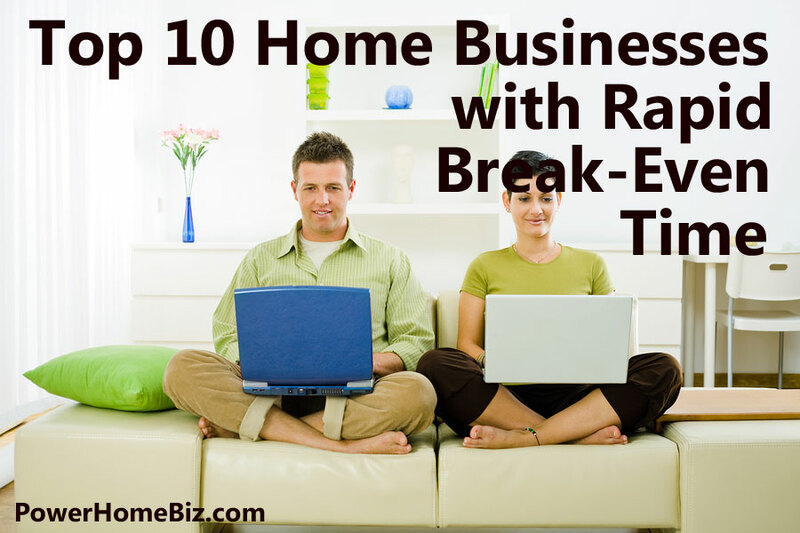 Here are 10 businesses you can start if you want to break-even as fast as two months to a year.